Are you facing challenges in managing administrative operations in your hospital? If yes, then, you must be encountering claim denials, underpayments, etc., which might be reflecting on your revenue cycle. When you decide to process the medical claims in-house, you are essentially spending a large chunk of cash on medical billing & coding, managing the revenue cycle, following up on the bad debts, etc., which is not your core work. Thus, when you outsource healthcare back-office support services for hospitals to us at Outsource2india, we can streamline your whole healthcare back-office support operations with our extensive experience in the healthcare support industry. O2I is a leading provider of healthcare back-office support for hospitals in India with over 300 healthcare support staff working 24/7. We can help you set up a healthy healthcare back-office support operation with an accuracy and deliverables on par with the international standards. In a hospital, the healthcare back-office support activities are confined to the non-medical areas, including billing, counseling, payment & follow-up, collections, insurance verification, etc. If you are managing all these at your own facility, then you must exercise extreme precaution. All the activities related to the medical claim processing are linked and would cause you an enormous loss if any error occurs. Thus, your healthcare back-office support strategies must be robust. One way to make it rock solid is procuring the healthcare back-office support services from O2I. Revenue cycle management (RCM) is the backbone of the healthcare back-office support process that can recover the clinical payoffs and generate more revenue. At O2I, we have more than 300 healthcare support staff who leverage the modern RCM tools to correctly record, store, and dispatch claims. We can organize your hospital's claims, help you generate revenue and process the payments/collections in an organized way. Our expert medical billing personnel can reduce the billing cost to a range of 40%. They can follow up with the payers for the pending claims, find out the reasons behind the denials, initiate the collection process, track the receivable balance, etc. Our medical coders are proficient in coding the diagnosis, medical services, procedures, and equipment with the appropriate codes by referring to the standard coding rules, including ICD-10-CM, CPT, HCPCS Level II, etc. They are also skilled in documenting the medical records and can provide an accurate transcription of the notes, laboratory & radiology results. Our AR experts can help you with AR calling, collections, following up on pending claims, claim denial analysis, tracking unsettled balances, etc. We have several AAPC-certified AR experts who know the length and breadth of the diagnostic and procedural coding. At O2I, we have dedicated resources and stack of the latest tools to manage the claim denials. We draw patterns specific to the healthcare facility to find out the exact reasons for denials. We can evaluate your in-house medical claim processing process and fix the denials, which would eventually lead to positive cash flow. 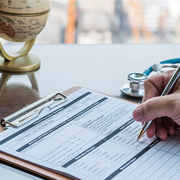 Through our healthcare back-office support services and medical claims processing support services, we offer a gamut of other support sub-services, including document scanning, patient demographic entry, claim adjudication, curating the explanation of benefits, filing claims, follow-up, etc. By leveraging our medical claims processing services, you can significantly cut the volume of rejected claims. We have a plethora of healthcare consultants who are proficient in providing all sorts of healthcare consulting, irrespective of your hospital's size and patient volume. Our healthcare consulting services encompass consulting on healthcare analytics, transcription, data security, claim processing, communication & delivery systems, etc. Through our healthcare back-office support services for hospitals, we can render practical solutions to help you adopt the best of the IT tools. We can collaborate with your hospital on setting up the health-related IT solutions. We can also update/upgrade your hospital's systems and provide data-migration services, on-site support services, etc. Why Choose Outsource2india for Healthcare Back-office Support Services? O2I is an ISO 9001:2000 certified healthcare back-office support company that strictly follows the HIPAA and HL7's guidelines and regulations. We have established the policies of HIPAA at every stratum of our organization. The medical records are stored in a folder whose admittance is on the need basis and no two experts have access to the same folders. We have achieved ISO/IEC 27001:2013 certification that shows our commitment to set up and implement the information security management system at each stratum of our organization. It also forces us to protect your medical related data at all costs. We have a total experience of 20 plus years in the healthcare back-office support domain. Our medical support staff surpasses 300 in capacity, and our combined management experience has crossed 100+ man-years. Our workplaces are equipped with the latest tools and infrastructure crucial to provide healthcare back-office support services for hospitals. Our workstations have a robust firewall, intrusion detection technology, VPN technology, 100% IT redundancies, 200% power backup, autonomous Internet Leased Circuits, etc. It allows us to deliver quality offshore services on time. We leverage the local expertise with our five-different delivery centers that allow us to reach our global customers in no time. Moreover, it also enables us to render world-class healthcare back-office support. We have a dedicated healthcare back-office support team working 24/7 and can provide round the clock support. Our support agents are always available for calls/chats/emails, etc., irrespective of the time-zone variance. We have the necessary pool of resources, both in terms of wherewithal and expertise to manage any surge in the demands. Thus, when you want to spike the deliverables, you do not have to spend any extra on hiring resources, you can just let us know and we will arrange for it. We believe in giving specific attention to each customer, and that is the reason why, when you decide on outsourcing healthcare back-office support services for hospitals, we will assign a dedicated project manager who will be your one-point contact. You can communicate with the person for any issue and get an immediate resolution. We plan all our healthcare back-office support solutions in advance that eliminates the risk of any changes in the deliverables. Furthermore, we have enough resources who can manage the deadline pressure, in case it happens. Outsource2india has been the foremost provider of healthcare back-office support for hospitals in India that also has expertise on RCM, Medical Claims Processing, AR Management & Follow Up, Medical Billing & Coding, Adjudication, Denial Management, etc. Our healthcare back-office support team comprises some of the most talented RCM experts, medical billers & coders, insurance support executives, reimbursement specialists, etc. They can recover and boost your hospital's cash flow and streamline the healthcare back-office support operations. You can collaborate with us to improve your hospital's productivity, cash flow, and enhance your workers' utilization via streamlined healthcare back-office support operations. Get in touch with us today!